This entry was posted on September 17, 2013 by Mary Holland. It was filed under Animal Adaptations, Animal Diets, Animal Digestion, Animal Signs, Mammals, Omnivores, Raccoon, September, Winter Adaptations . Checked today and it hasn’t been touched, surprisingly! 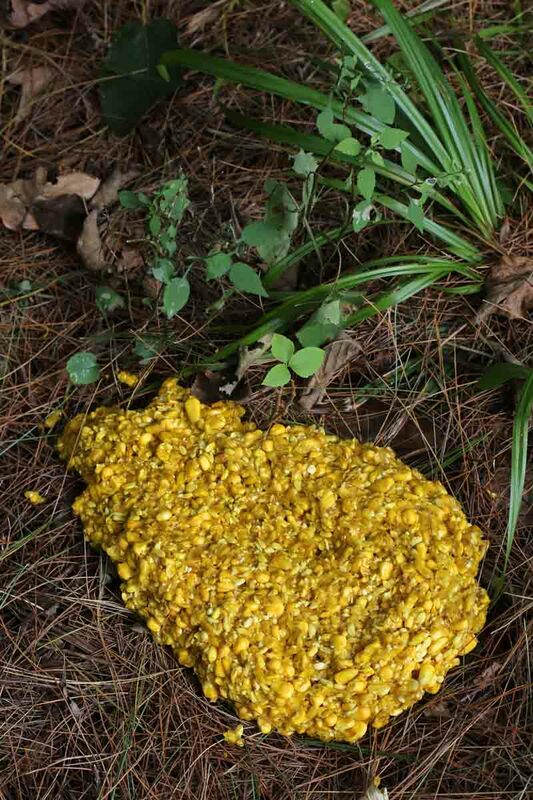 I came across a similar, somewhat bigger, pile last fall and concluded it was bear vomit–I actually Googled “bear vomit” because I thought the animal that left this pile had to be big, and saw images that confirmed–any ways to tell the difference? I concluded raccoon because the corn had obviously been visited by a raccoon — only one or two stalks pulled down in one place — presume a bear would have mashed down many stalks and made much more of a mess. But it’s possible a bear got into the field in another area and wandered a bit before entering the woods and getting sick. unfortunately I have a somwhat somber take on this. I have noticed that the corn that my husband feeds the birds is routinely thrown up and I suspect that GMO’s have something to do with this. I really want my husband to stop feeding corn or even have it in our basement where our cat can get to it because of this. GMO’s are lethal. This pile may be from eating too much, but I wonder and don’t eat corn anymore unless I know it is organic.